Rounded out with new English translations of previous works, the resulting book is a wide-ranging portrait of one of the towering figures of contemporary thought—philosopher, anthropologist, ethnographer, ethnologist, and more. 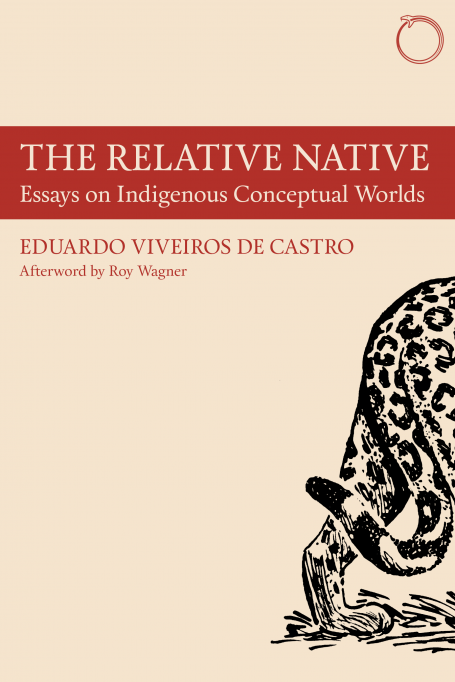 With a characteristic afterword by Roy Wagner, elucidating Viveiros de Castro’s influence and engaging with his arguments, The Relative Native further cements Viveiros de Castro’s position at the center of contemporary anthropological inquiry. The strength of Viveiros de Castro’s essays is that we no longer have to worry about apathy at all; we are engaged. … To me, these magisterial essays are the benchmark of twenty-first century anthropology, not so much a new beginning as a figure-ground reversal of the old one… [an] arbiter of human perception. Eduardo Viveiros de Castro’s seminal lectures and essays on cosmological perspectivism provide a careful and highly innovative introduction to many themes that have become central to the ontological turn in anthropology, including multinaturalism against multiculturalism, transformation/exchange versus creation/production, and performativity replacing representation. They offer invaluable insight into an anthropology operating in a space where we have been neither modern nor primitive. By way of a kind of guided reverse engineering, the brilliance of Viveiros de Castro’s arguments in his lectures and essays is made visible as a function of the intensities of Amazonian and (or ‘as’) other ways of living. In the process, anthropology itself is made visible as a form of living dedicated to just that: making other forms of living visible; which is to say imaginable, conceivable. Anderson, Eugene N. “The Relative Native: Essays on Indigenous Conceptual Worlds.” Ethnobiology Letters 7, no. 1 (2016): 42-44. … this book will challenge all your preconceptions, whatever those are, and also teach you a great deal about eastern Amazonian concepts of the world…. if you want to see how far contemporary anthropological theory can go into speculative and critical realms, this is your book. As Roy Wagner illustrates in the Afterward, this collection of essays form part of a paradigm shift in the discipline of anthropology which has led to the emergence of ‘the anthropology of ontology’. Here, the work of Brazilian anthropologists Eduardo Viveiros de Castro and Tânia Stolze Lima, in part a synthesis of wider ideas of Amerindian perspectivism drawn from a wide range of anthropological accounts. De Castro’s account of perspectivism, drawing on Gilles Deleuze, speaks of a state of nondifferentiation between humans and animals, and of the interpenetrative nature of self and other. For De Castro, perspectivism is the idea that all beings originate as humanity (‘culture’) and separate themselves from humanity by becoming animal bodies (i.e., what ‘we’ call ‘nature’). In many ways this is the inverse of a Cartesian dualism, where humans originate as animals and proceed to create a dichotomy between humans and nature (with culture placing us above the natural). For the first time, the most influential essays and lectures of Eduardo Viveiros de Castro, including the fundamental 1998 Cambridge University Lectures “Cosmological Perspectivism in Amazonia and elsewhere” and other lectures spread in different publications, are collected in this volume of the utmost importance. Viveiros de Castro is considered one of the most important contemporary Brazilian anthropologists, a “towering figures of contemporary thought”, one of the major figures of the “ontological turn”, and this book is a guide and the sum of his reflections on cosmological perspectivism, human-non-human relations, the ontological turn in anthropology, nature and culture, and relationships.